Bridge of Entrepreneur International Design Competition for Zhong’an Chuanggu Technology Park. Anhui Zhong’an Chuanggu Technology Park Co.,Ltd is a leader of its kind as the “co-maker space, business incubator, accelerator, industry base and fund cluster” in China, which is the sponsor of this international design competition. 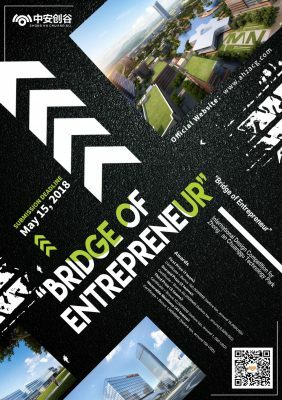 Taking “Bridge of Entrepreneur” as the subject, this competition serves as a platform to gather the wisdom from all over the world with the intention to develop new ideas in building an international technology park in the future in a fresh light, focusing on the communication between people, cities and architectural spaces. The proposal should combine high technology and other modern elements to reflect the industry orientation. Urban Environment Design (UED) Magazine covers the frontier ideas and practice of architecture, predicts the trend of contemporary architecture, and analyses the profound relations among architectures, events, city and environment. From domestic to international, from established architects to emerging minds, UED Magazine reports the current significant events, competition, ideas, and works.